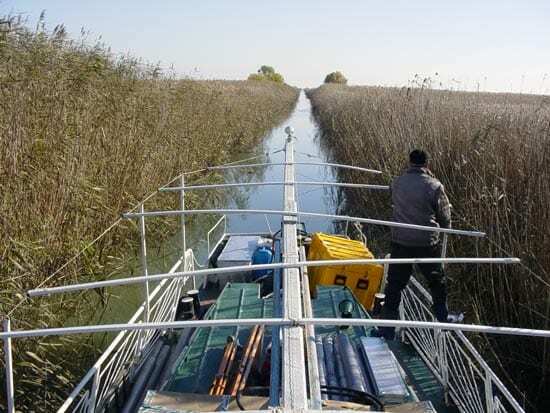 “The Danube Delta is like the Everglades,” said Liviu Giosan, who grew up near the Romanian wetlands. More than 300 bird species and 45 freshwater fish species make homes in the fertile labyrinth of marshes, dunes, and channels. The triangle-shaped, sediment-rich region at the mouth of the Danube River is also rich with human history. The area has been settled since the Stone Age, and the ancient Greeks, Romans, and Byzantines built trading ports and military outposts along the coast. A traditional maritime culture persists on the delta, and the United Nations has declared the region a World Heritage site. The Danube is Europe’s second-longest river and a major artery for trade and transportation. Starting in the Black Forest in Germany, it winds 2,850 kilometers (1,770 miles) through nine countries before pouring into the Black Sea from Romania and Ukraine. A proposed project to dredge several arms and channels of the river for shipping will fundamentally alter the delta, said Giosan, a coastal geologist at Woods Hole Oceanographic Institution. “We have experience from other parts of the world with the damage that occurs from altering rivers and wetlands,” he said. “Why not learn from that? The delta—named for its resemblance to the Greek letter Δ—serves as a sieve filtering fresh water and sediment from the European interior before it reaches the salty sea. Buried in the sediments lies a geologic record of a moving, changeable shoreline that has shaped human history; in recent years, history has been shaping the river. For several years, Giosan has been working with geographer Emil Vespremeanu of Bucharest University and WHOI geologist Jeff Donnelly to dig into the Danube’s secrets. They traveled in small “dormitory” boats from Tulcea, where the roads end, to a base station near the Black Sea coast. 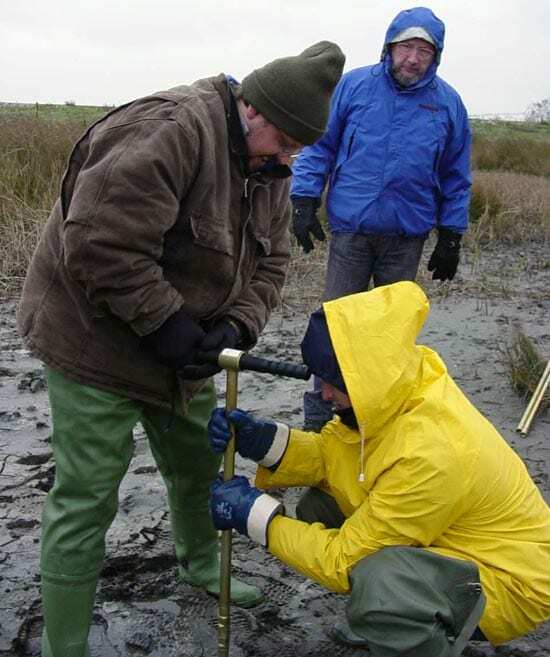 They cruised small canals and arms of the river to take sediment cores from old beach ridges, and they used sonar to chart the shape of the seafloor near the mouth. Blending field geology with computer modeling, they are reconstructing the forces that changed the flow and structure of the delta in the past and figuring out what this can tell us about how the delta could change in the future. “We need to understand the river mouth, where a delta is built,” said Giosan. 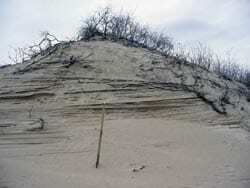 The traditional understanding of deltas holds that the river carries all the mud and sand deposited at the river mouth. But Giosan questioned this old assumption, and he and his colleagues are showing that not all the sediment is brought by the river. Waves, currents, and tides also help build the delta from the seaward side by moving and depositing sediments at the coast. In fact, the river can serve as a natural barrier to the flow of water and sand that builds and erodes the coast. Evidence suggests that the ancient port of Istria may have been shoaled behind a barrier beach when changes in river flow through the delta brought more sand southward along the Black Sea coast. 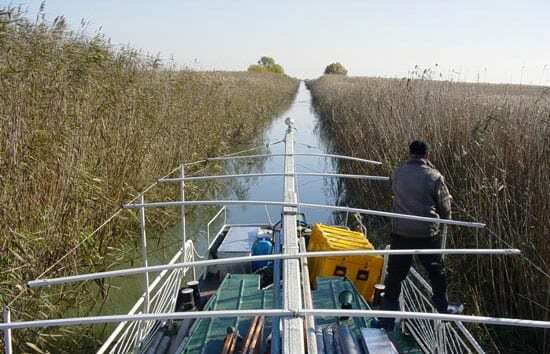 Preliminary findings by Giosan and colleagues also suggest that the Danube Delta may be much younger than previously thought. “The construction of a delta is a delicate balance between river discharge and coastal currents and waves,” he said. And that balance is in peril. In the 1860s, European leaders internationalized the Danube region and dredged one navigable channel through the delta—called the Sulina arm—to open the European interior to bigger ships. For 150 years, Europeans have established commissions and written treaties to protect and exploit this vital waterway. The imperative became clear in 2004 when the former Ukrainian government unveiled plans to revive inland ports by dredging a 170-kilometer (105-mile) shipping channel along the Chilia arm of the Danube, on the border with Romania. To date, a 3-kilometer (1.8-mile) canal has been carved through ecologically sensitive territory, prompting protests from environmentalists and the governments of Romania, the United States, and the European Union. Giosan believes that an improperly designed project could fundamentally change the flow through the delta. Increasing the water flow through Chilia would significantly increase the sediment load in that arm and increase erosion along the coast. At the same time, it could deplete other arms of needed fresh water and delta-building sediment, allowing salt water to penetrate the wetlands and turning fertile habitat into a brackish wasteland. The technical details of the Ukrainian project are sketchy, and Giosan and colleagues hope the new government might reconsider the project long enough to get an impact study requested by the international scientific community. Perhaps scientists’ voices can be heard before the dredges are sent in. This research was funded by the WHOI Coastal Ocean Institute and a WHOI Independent Study Award.